Sole E95S Elliptical Trainer Review by Industry Experts. The Sole E95S Elliptical Trainer is On Sale! Best Buy! Commercial Grade Quality for Your Home. If you are looking for an elliptical trainer for your home that you can beat the #%@& out of, you’ll want to consider the Sole E95S. Besides being one of the most durable residential ellipticals on the market, it has many other exceptional features. For example, it provides adjustable stride length so you can work different muscle groups. Plus, taller individuals can adjust stride length so they are comfortable during a workout. This is one of the most affordable adjustable stride length elliptical on the market. It also comes with a heavy duty flywheel, large over-sized foot pedals, and a 10.1″ LCD display. This model has Bluetooth technology to sync with the Sole Fitness smart app. Track your fitness stats with this machine! Sole ellipticals are well know for their reputation as stable, durable, and low maintenance machines. They are also backed with fantastic warranties. When our team visited the Sole Cooperate headquarters, we talked with the Vice President of Sales and Marketing. He explained that Sole is always trying to provide the highest quality at the best value, and we feel for the most part they have been very successful at this proposition. 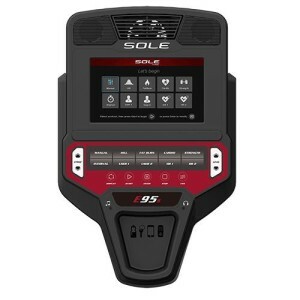 Bluetooth Technology – It is easier than ever to track your workout stats with this Sole E95S model. Bluetooth technology on the elliptical works with the Sole Fitness smart app so you can track your workout statistics. Read more about the new Sole machines. Adjustable Power Incline —The ability to adjust incline can take your cross-training up a notch. It lets you to work specific muscles groups like your glutes or quads. Heavy Duty Flywheel — A heavy flywheel allows for a comfortable and fluid elliptical motion. You’ll notice when you start the motion on the Sole E95S it takes an effort to get moving. And when you stop the motion it gradually stops. This is how you want the elliptical motion to perform. Stable Dual Wheel Design — Sole machines have two concave wheels moving along a track for a much more solid motion that most competition models. 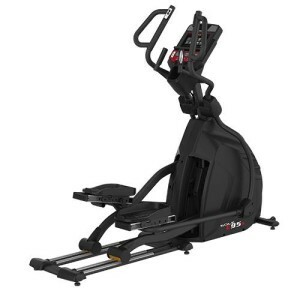 18-24″ elliptical stride — This is one place that the E95S excels over the Sole E95. Its wider range of stride length allows for a smooth elliptical motion more in line with those top priced machines. Elongated Handlebars — The handlebars on this machine allow you to grip with various positions. This lets you target different upper body muscles. Includes Heart Rate Control — Many people love heart rate control because it lets you determine your level of exertion. The Sole E95S comes with pulse grips and is chest strap compatible. Adjustable foot pedals — The foot pedals were developed in collaboration with a leading physical therapist. A 2 degree inward slant to the pedals will reduce angle and knee stress common with other machines. The Sole E95S weighs a hefty 260 lbs — This machine is heavy! It contributes to stability and sturdiness. This is especially important for heavier uses or those who like to go really hard during their workout. You may want to consider inside delivery. 10.1″ TFT LCD Backlit Display —The vibrant 10.1″ display shows speed, incline, time, distance traveled, calories, pulse, and pace. It also shows a 1/4 mile track and a peak/valley graph. Generous Warranty — This machine comes with lifetime coverage on the frame, 5 years parts, and 2 years labor. 84″ Length – This machine is really stable but a bit of a space hog. Check out a comparison chart of the Sole Elliptical models. Once again, this is probably one of the most durable elliptical trainers available for residential use. There are other commercial grade brands for residential use like Precor or LifeFitness, but plan on taking out a second mortgage to buy one. With the Sole E95S you get exceptional quality at a value price. Also note that Sole has an excellent reputation for standing behind their products is also important to consider. We are not aware of any issues with their customer service, which is not something we can say about all of the leading brands out there. The only downside to this machine is its size. If you have the room to accommodate its 84″ length, then you will be good to go! *This Sole E95S Elliptical Trainer Review is based on not only testing the equipment, but also comments, testimonials, reviews and ratings of customers and third parties. We attempt to be as accurate as possible. Warranties, features and prices can change without notice. I am I te rested in the E95s, yet I am 5’4″ and want to make sure it is appropriate for my height. Also, is assembly required? If so, how challenging is it. Lastly, how much power does this equipment utilize? Nice to meet you. The Sole E95S should be okay for your height as it features an adjustable stride length from 18 inches up to 24 inches. As to assembly, it is minimal and not difficult. Regarding power, it will plug in to a normal home electrical socket. Good luck! Wondering about head clearance for the E95S … my basement ceiling is about 85″ and I’m about 71″. Would this work without grazing my head on the stucco? I note that the E95S lacks a pretty common feature – adjustable incline. Never having owned an elliptical, I don’t know how much that matters. What’s your take? Maybe incline is something I can’t use in my basement, anyway. We generally recommend you add 18″ to your overall height to determine ceiling height requirement. Yes, Sole offers a “Turnkey” option cost of $239 currently on their website. When you add the E95S to your shopping cart and go for check out, that’s where the option of delivery/set up is available.